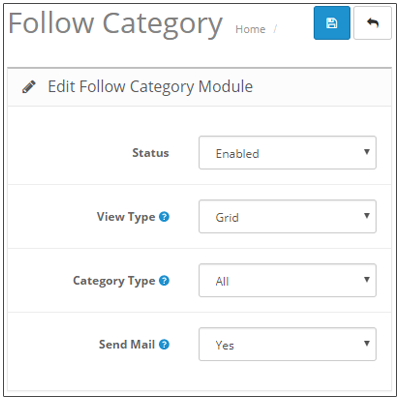 Opencart Follow Category: Opencart Follow Category Module will provide a feature to the customer to follow the categories according to their choice. The customer can follow or unfollow the categories and sub-categories. 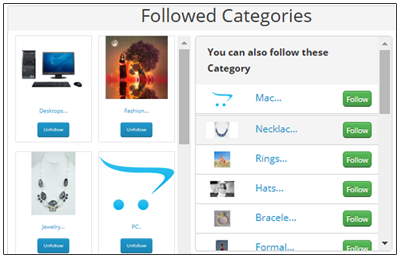 The customer can make their own list of following categories and can go to the category in a single click. The admin can manage all the followers on the basis of customers and categories. The admin can also view the list of the customers who are following categories and categories which is followed by the customers as well. The admin can set the layout of this module to different pages of the store. The admin can set the category view type as grid and list for the front end. The admin can configure categories that all categories will appear or only parent categories will appear at the customer end. The admin can configure to send automatic emails to customers when a new product will add in that category which is followed by the customer. The admin can see the category list with the total number of followers. The admin can see followers category wise and can redirect to the category page from there. The customer can view and manage their followed categories from their account section. The customer can see the followed categories and unfollow categories separately. Can set front view of the store categories either in the list view or the grid view. Can either select category type as “All” to show all the categories or “Parent” category to show only the parent category to the customers. Can also enable or disable the email notification to the customers when a new product gets added in the followed category. Category Follower: Under this tab, the admin can view the list of category along with the total followers of the respective category. Customer following: Under this tab, the admin can view the list of customers along with the total number of categories they will be following. The customer can easily follow or unfollow the categories. For this, the customer has two lists: “Followed Categories” and “Unfollowed Categories” in their account. To follow a category, the customer can select any category from the “Unfollowed Categories” list. Similarly, to unfollow a category, the customer can select any category from the “followed Categories” list. 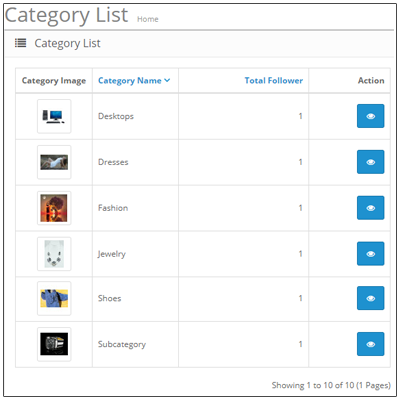 Also, the customer will view the followed categories either in the grid view or the list view. It will depend on the admin selection from their configuration. Did you buy Opencart Follow Category?